Yes, I admit it....I have a big ol' HEART-ON for NY! NBC Studios (where The Today Show is filmed). Radio City Music Hall Marquee - home of the Rockettes. (I was only 13 years old when I first went to Radio City, on a school trip. And it was then that I first fell in love with NYC). Thank you for taking this tour everyone! The Plaza (I reckon I could get lost in there - no problem); St. Patrick's Cathedral (what a wonderful creation) and Chanel on Maddison (well, who wouldn't like shopping in there?). Is it any wonder you LOVE New York? .........What a great vacation.......(remember when they added that tag line to the song?) great photos again, Ron. Have you ever been inside the library? I have not, but I think I'd love it! How fabulous to have gone on a field trip to the Big Apple at that age! I am so jealous! Have a super week! Hey....are you going to give us any details of food you ate while there?? Yes Ron, I do remember those TV commercials for I Love NY! I watched them when I was a teenager still living New York. I also remember going to Radio City Music Hall and seeing the Rockettes for the first time. I was in awe! And one of my sister's friends who was a professional dancer became a Rockette. I remember being so impressed! Love the photographs. The one of the library is beautiful. And that last shot of the Empire State Building is gorgeous! Chanel on Madison - SWOON! Thanks for the tour of my hometown, Ron x Have a wonderful week! Ron, it's been ages since I've seen those I love NY commercials. God, Frank Sinatra! Those commercials were very smart because they turned NY around during a bleak time of financial struggle by getting tourism up and bringing more people in. Lovely photographs. St. Patrick's is not only beautiful on the outside, but the inside is grandiose. 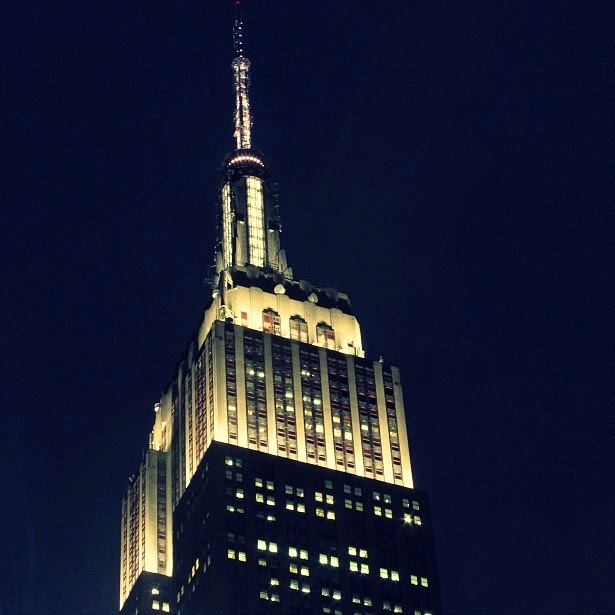 And there is nothing quite like looking up and seeing the top of the Empire State Building at night. Amazing shot! You should be a goodwill ambassador for NY because your passion shines through. Can I ask, what kind of camera do you use? Hey, Ron, these are fabulous pictures! The mayor SHOULD hire you as a goodwill ambassador. You'd do a bang-up job! When I look at your photos of New York, I keep thinking I should go to the Big Apple on my next vacation--and then I remember that I already live there! That's someone Heart-on you've got there, Mr. Ambassador! And you don't even need Viagra! "Yes, I admit it....I have a big ol' HEART-ON for NY!" Lol! Ron, if anyone should be a goodwill ambassador for New York, it should be you. Hell, I think you should run for MAYOR! Beautiful pic of St. Patrick's Cathedral. I love the contrast of the glass modern building next to its Gothic architecture. The ones of the Empire State Building are killer. How did you get that last shot at night? It's so clear.
" St. Patrick's Cathedral (what a wonderful creation)"
It's truly magnificent. Two years ago they did a lot of reconstruction on both the interior and exterior. I remember going into St. Patrick's when I first moved to NYC and being awestruck. But it's one of those places that no matter how many times you visit, you always get that feeling. It's like....WOW! Thanks so much for stopping by, dear lady. Happy Monday to you! Thanks for posting these beautiful photos; it was wonderful to visit NYC without the hustle and bustle of city life! "What a great vacation.......(remember when they added that tag line to the song?)" "Have you ever been inside the library? I have not, but I think I'd love it!" Yes, I have. In fact, two years ago when I went into NYC with my friend Val, she and I went inside and took pictures. I posted them two summers ago. The place is stunning and so MASSIVE. I actually have a picture of me and two friends sitting on one of those lions. It was way back in 1974, when I went to NY and auditioned for The American Academy of Dramatic Arts. "Hey....are you going to give us any details of food you ate while there??" HA! You're right, I should have mentioned the FOOD I ate while I was there. Which btw, I ate TONS. I was there for about 8 hours and walked so much that I was constantly hungry, so I stopped in several places to eat. Everywhere you go in NYC, there is food, food, food! You remember those commercials? Weren't they GREAT? "And one of my sister's friends who was a professional dancer became a Rockette. I remember being so impressed!" OMG...that IS impressive! Last summer while I was at work, I was talking to a customer who was visit Philly and we just happened to mentioned NYC. She told me that she was at one time a professional dancer on Broadway and had also been a Rockette! "Chanel on Madison - SWOON!" 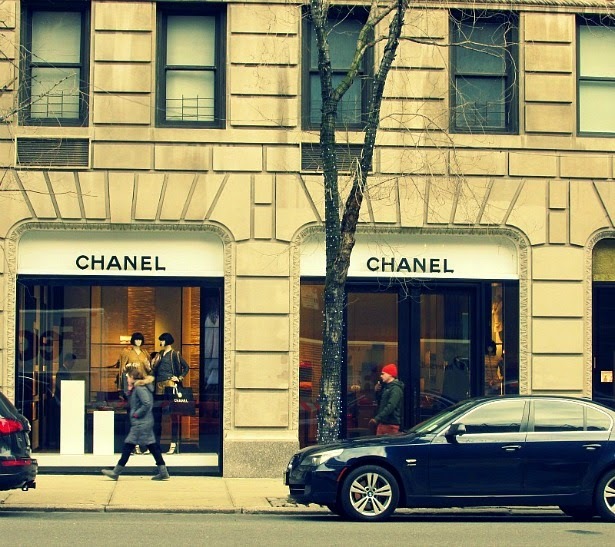 There are several Chanel Boutiques in NYC. I've been to the one in SoHo, but never the one on Madison Avenue. Wonderful photo tour! I've seen most of these in person, but your photos always put things in a different perspective so that it's like looking at something I've never seen before. Nice job. HA! I thought the same thing, Elaine. I had forgotten he was in that commercial. And also Liza Minnelli and CHER!!! "Those commercials were very smart because they turned NY around during a bleak time of financial struggle by getting tourism up and bringing more people in." You're absolutely right, they did turn NY around. In fact, I was living there during that bleak and financial struggling time (in the 70's-80's). And that's what I so admire about NYC, it knows how to rejuvenate itself. "St. Patrick's is not only beautiful on the outside, but the inside is grandiose." I use a Canon Powershot. It's both an automatic and manual camera. It's nothing fancy but it takes nice shots. I eventually want to upgrade to DSLR some day. "The mayor SHOULD hire you as a goodwill ambassador." Hey, maybe you could put a good word in for me? HA! "When I look at your photos of New York, I keep thinking I should go to the Big Apple on my next vacation--and then I remember that I already live there!" "That's someone Heart-on you've got there, Mr. Ambassador! And you don't even need Viagra!" Yup...and it's the size of the Empire State Building! Thanks so much for stopping by, buddy. Have a SUPA' week. And say hello to the Big Apple for me!
" Hell, I think you should run for MAYOR!" HA! I think I should too!
" I love the contrast of the glass modern building next to its Gothic architecture." And you should see the INTERIOR of St. Patrick's, it's GORGEOUS! I got that shot of the Empire State Building by placing my camera on a newspaper vending machine on the street and then adjusting the settings for a longer exposure. I took about 8 photographs, but I only got one shot that came out clear. You are so welcome, Suzi. Glad you enjoyed the tour. And thanks so much for stopping by, my friend! Thank you :) Glad you enjoyed. "I've seen most of these in person, but your photos always put things in a different perspective so that it's like looking at something I've never seen before." I think that's because NYC is one of those amazing places in which your perspective changes whenever you view it through photographs. Being there (and because it's such a BIG city), you don't always see it the way a camera captures it. Thank you :) Glad you enjoyed this blog series. But I PROMISE, no more NYC pics for awhile - HA! "Now is your next post gonna be about that time you worked with NSYNC? ;)"
HA! OMG...I wish I had taken pictures back then, or I would post about it. Have a faaaaaaaabulous week, my friend. And thanks so much for stopping by! Ron, I though you did use a DSLR camera because your photographs look like you took them with a pro camera. Nowadays, even with a non-professional digital camera, you can do so much more than you could years ago. They keep getting better and better. But I also edit a lot my photographs, so that helps too. Yet, at a point where I want to start using manual mode more and developing a better skill. No, it's just delusions of GRANDEUR - HAHAHAHAHA! I always enjoy your NYC posts, because I have a fascination with the city and as previously stated, would love to spend a long weekend there with Tara just to take in all the sights and sounds. And foods, of course. Diabetes be damned, I refuse to pass up a really good bagel there! "because I have a fascination with the city and as previously stated, would love to spend a long weekend there with Tara just to take in all the sights and sounds." And if you did, I would LOVE to meet you two there. OMG...how much fun we'd have! "And foods, of course. Diabetes be damned, I refuse to pass up a really good bagel there!" I know, the really good food in NYC is sinful, but OH so faaaabulous! Have a fantastic week, buddy. And thanks for stopping by! OMG Rob, I am literally sitting here laughing so hard at that! HILARIOUS! I love looking at historical buildings and all of these were fabulous. I especially liked seeing the Empire State Building, just amazing. Saw the old 40's flick: An Affair to Remember last week, at it featured a key scene on the top of that famous building. "Saw the old 40's flick: An Affair to Remember last week, at it featured a key scene on the top of that famous building." Yes, Geraldine! The Empire State Building is featured in that film! It was also featured in "Sleepless In Seattle" which paralleled the movie, "An Affair To Remember." BOTH great films! Thanks, sound interesting. I may stop by sometime this week! 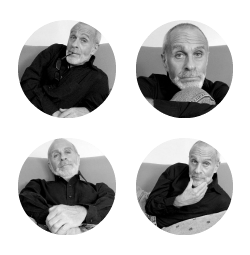 Fabulous photos Ron! BTW you have just had a sneak preview of our visit to NYC as I inadvertently published it halfway through when in fact not only had I not finished writing the post, it will not actually be posted for another 3 weeks! There are two more posts before that one because we visited Toronto and Niagara! I thought I'd just posted a comment???? HA! Yes, I have off today, so I'm responding to comments this morning in between doing my laundry. However, I will be signing of the Internet soon, but will be back online later tonight. No, not snow left but it's raining/snowing right now and very cold. I hear we're getting a lot more snow later this week. Can't wait! Ron, NO WAY am I tired of seeing photos of NYC and accompanying you on your visit! I think the best way to see the city is in the company of someone who knows its ins and outs, and LOVES it! 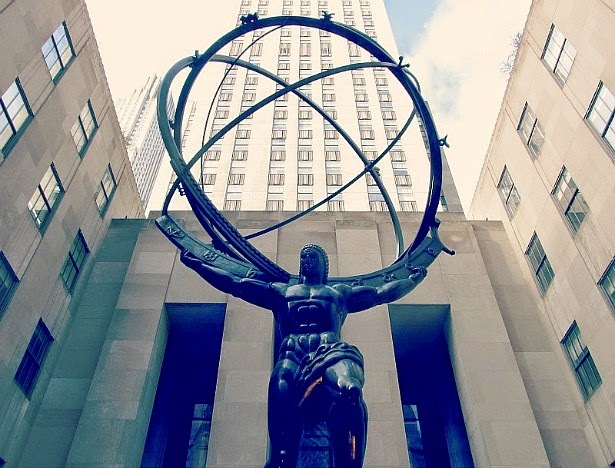 I remember seeing Rockefeller Center and St. Patrick's, as well as the store windows at Christmastime. It was simply magical, and I'd love visiting again! Thanks for letting me tag along -- happy Monday to you! Ron, you ARE an ambassador for New York! I've said this before, anytime you post about that city I can hear the love and passion in every word and every photograph. Like these. They're fabuloso! The one of the library is just beautiful. I like how caught the light from the sun casting shadows. And the ones of the Empire State Building look like they came out of a magazine. The detail in the nighttime view is amazing. Have you ever been to the top? Thanks for the great tour, Ron!
" I think the best way to see the city is in the company of someone who knows its ins and outs, and LOVES it!" I agree! My brother Tom may be coming for a visit in September and wants me to take him to Manhattan because he's never been there. I can't wait to show him around! "as well as the store windows at Christmastime." To me, there is no place on earth like Christmastime in NYC! "Ron, you ARE an ambassador for New York!" I guess I'm an out-of-state ambassador - HA! But it's funny, because NYC has always felt like HOME to me. I took that shot of the library when I first got there, so the sun was shinning. Yet in some of the other photos, the sky had turned grey. Yes, I've been to the top of the Empire State Building many times and the view is breathtaking. However, they now charge almost $30.00 to go to the top! And I'm sorry, but that is way too much. I think I paid about five or six dollars back when I lived there. Thanks for stopping by, bud! Have a spectacular week! Thanks for sharing those pics of New York Ron! I love seeing people's travel photos! You so welcome, Benze! Yes, I too love seeing people's travel photos. I am so fascinated with traveling. Thanks so much for stopping by, my friend. Have a terrific week! Hope you're feeling better. Fabulous shots of this amazing city! Have a super day and thanks so much for stopping by! The Plaza is such historical spot in NYC, isn't it? I often think of how many people through all the decades have past through those front doors!
" It's also interesting to me that on my very first trip to NYC...my husband / then boyfriend...made sure I saw each and every single one of those things in your photos!!" 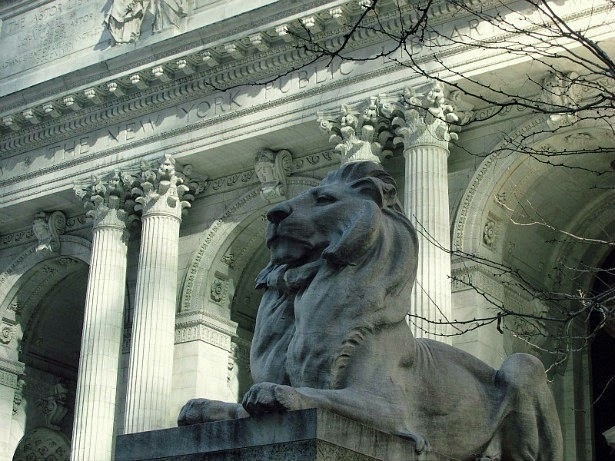 Yes, these are the MUST-SEES (along with some others) that are NYC landmarks!!! ".as was Windows on the World. I will never forget that elevator ride up. It is rather sad to think about it now. We were there the day before they bombed the World Trade Center the first time. Very scary thought." WOW, that's right, I forgot about the first bombing. It's ironic you shared that because I was there a month and a half before the 9/11 attacks. And you're right about the elevator ride up, I'll forget it. It was so fast! Gorgeous shots of the city. I especially love the cathedral against the more modern building. I've always liked the juxtaposition of old and new. "I've always liked the juxtaposition of old and new." Meeeeee too! It's like seeing the past with the present. The Empire State building day and the night shot--well done! And I was a bit sad to see the Cathedral shoved next to the wall of glass, but I suppose they can't all be in quaint small places or secluded bits of countryside. Most aren't any more. Oh how cities change, huh. But it's cool when we preserve bits. Like Lord and Taylors...I wonder how long they've held on to that frontage. I'm a sucker for NEON too. LOVE it! It feels so vintage to me! "And I was a bit sad to see the Cathedral shoved next to the wall of glass, but I suppose they can't all be in quaint small places or secluded bits of countryside." Yes, you're right. But that's kinda what I love about city life; especially a city like NY, it's got such a neat blend of modern mixed with old. And like you said, it's preserving bits of history. Like Lord and Taylors...I wonder how long they've held on to that frontage." Since 1826. Can you believe that!?! "K...enough of NYC for NOW. But only cuz I know we'll get another visit! :-)"
Thanks so much for stopping by, dear lady. Have a great rest of your week! OK... I want to go to NYC!!!!!! I have never been. How cool would it be if I could go and you could take me around!!! These pictures are beautiful. 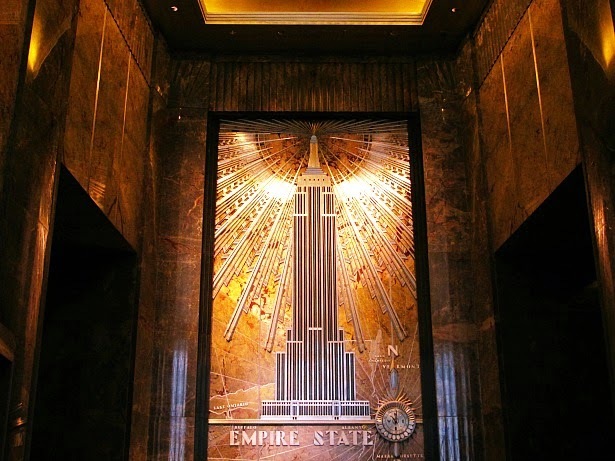 My favorite is how you captured the inside of the empire state building. The radio city picture is especially gorgeous too. It almost looks like religious icons on the right... VERY cool!!! "How cool would it be if I could go and you could take me around!!!" OMG Katherine, I would LOVE that! Can you imagine the two of us roaming around that city with our cameras? We'd have a BLAST! And I would especially like to see it with someone like you because I know you'd really get into it. "My favorite is how you captured the inside of the empire state building." It's all designed in Art Deco, which I love! Thanks so much for stopping by, my friend. Have a grrreat rest of your week! I do remember that commercial! So many things to see and do in NYC! Nice photos! You certainly would make a marvelous Ambassador! One of these days I'll have to give the city another try. You sure make the case for it. Glad you have so many memories of good times you've spent there, living and visiting. Thank you :) As you know, I ADORE NYC with all my heart. It's truly a city in which I feel TOTALLY connected to. "One of these days I'll have to give the city another try. You sure make the case for it." I know NYC is not for everyone, but it's a place I feel can be enjoyed even for just a visit. Thanks so much for stopping by, my friend! So glad you're back blogging!